Morrisons Hunslet is to hand out free fruit to children in its Church Street store, to prevent unsold fruit being thrown away, to offer young people one of their five-a-day, and to help make the shopping trip easier for busy parents. 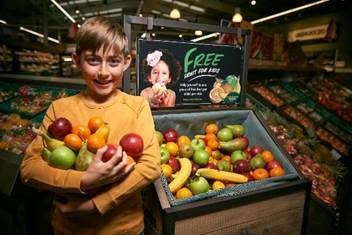 A range of ‘child friendly’ types of fruit – including bananas, apples, pears, sweet clementines, and satsumas – will be offered in the store’s entrance. The fruit will be located on a wooden stand at the front of Morrisons greengrocery area. Every morning Morrisons Hunslet’s greengrocers will replenish the free fruit stand with produce that otherwise has a chance of being binned. Morrisons Hunslet will offer a wide range of varieties of fruit in the scheme including; ‘top fruit’ – such as apples and pears; citrus – such as oranges and clementines; and tropical fruit – such as bananas.